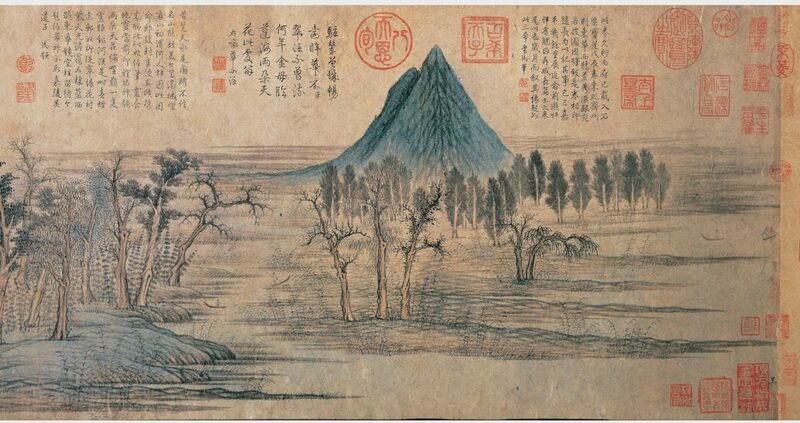 Li Cheng’s “A Solitary Temple Amid Clearing Peaks” is perhaps his best-known work that represents the Song national landscape style. We immediately notice the majestic central peak that is the focus of the painting. Surrounding the central peak are several smaller peaks engulfed by light fog and disappearing into the mist. A solitary temple sits in the middle ground near the base of the central peak. The trees have dark outlines and seem to have a prickly texture. 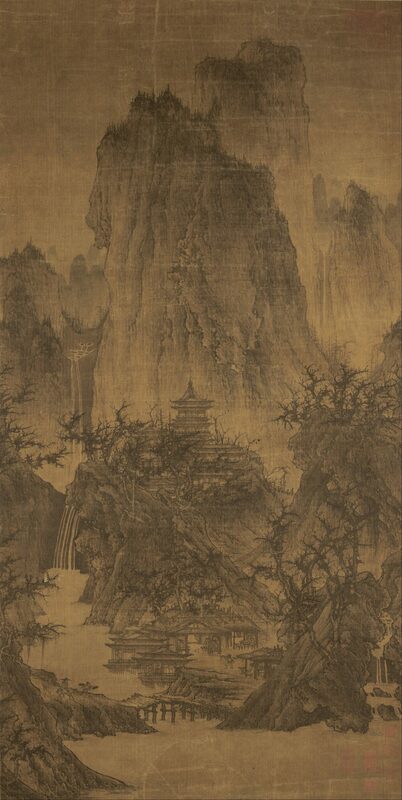 Li Cheng juxtaposes precise brushwork for the structural architecture with pale ink for the backdrop of the misty mountains. Wang Meng was the youngest of the Four Great Yuan Masters and was a grandson of Zhao Mengfu. 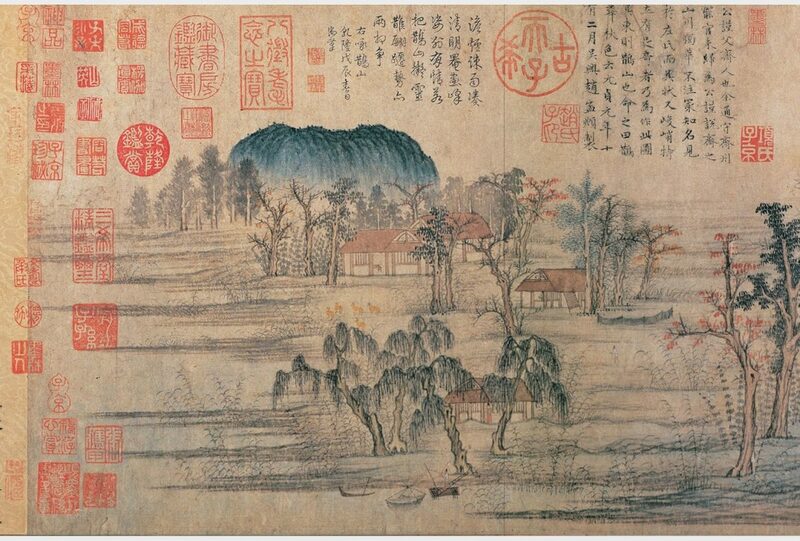 His “Ge Zhichuan Moving to the Mountains” shows the Taoist doctor and theorist Ge Zhichuan moving his abode to Mt. Luofu. He is depicted crossing a bridge with a buck followed by his family, household servants, and his child riding on an ox. Ge Zhichuan was a doctor of Traditional Chinese Medicine during the Eastern Jin dynasty (265-420). It was said that he made elixirs of immortality at Mt. Luofu, which was known as a sacred mountain in Guangdong for Taoist cultivation. 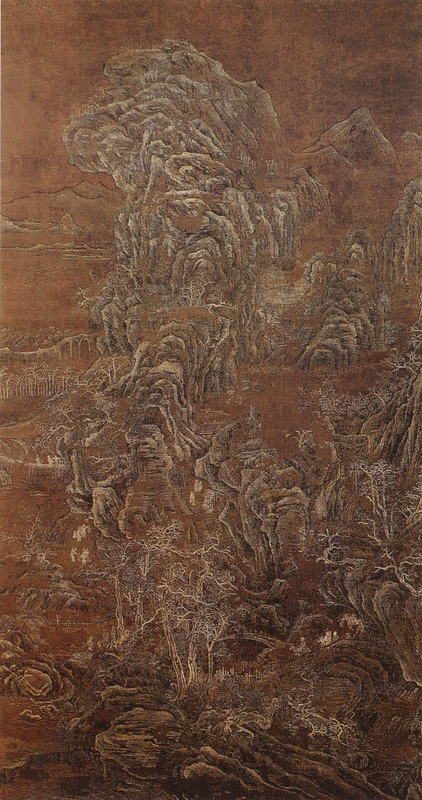 Wang Meng portrays the numerous peaks and forestry of Mt. Luofu with dense brushstrokes and intricate, convoluted patterns. Several thatched huts are situated within the elevated peaks, resembling sacred dwellings in a reclusive world. 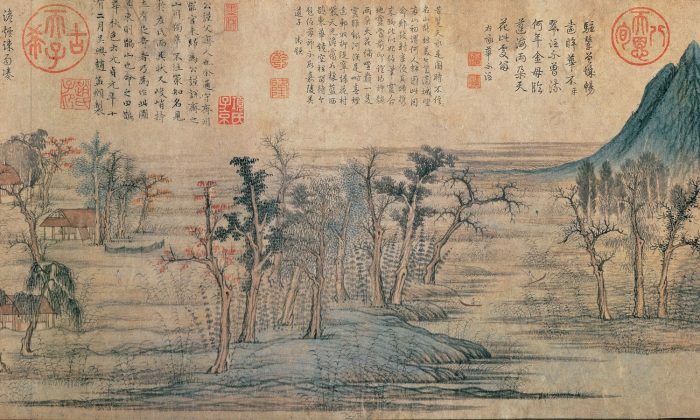 The idea of self-cultivation through seclusion was also a major theme for Yuan dynasty literati painters.